July 21: Loses visfestival. 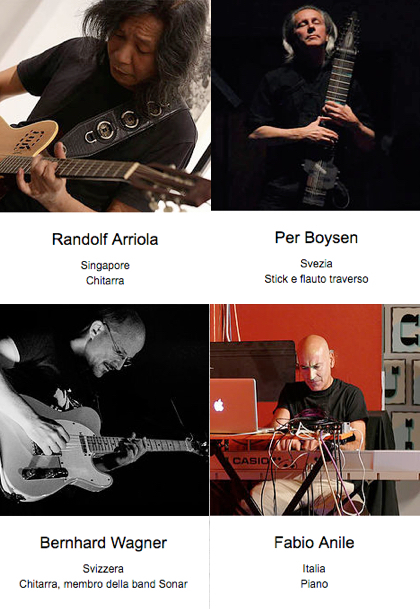 “Between space and ethno” (Chapman Stick + electronics). Instrumental concert including one spoken word collaboration with Kurt Öberg reading Olle Svensson’s “Återställelse”. October 13-31: USA 1331 tour, east coast / west coast. Experimental art festivals in Providence plus a handfull of concerts in California. Alto Traverse Flute with interactive electronics; real-time composition, live sampling, live looping, real-time Musique Concrète. 1. 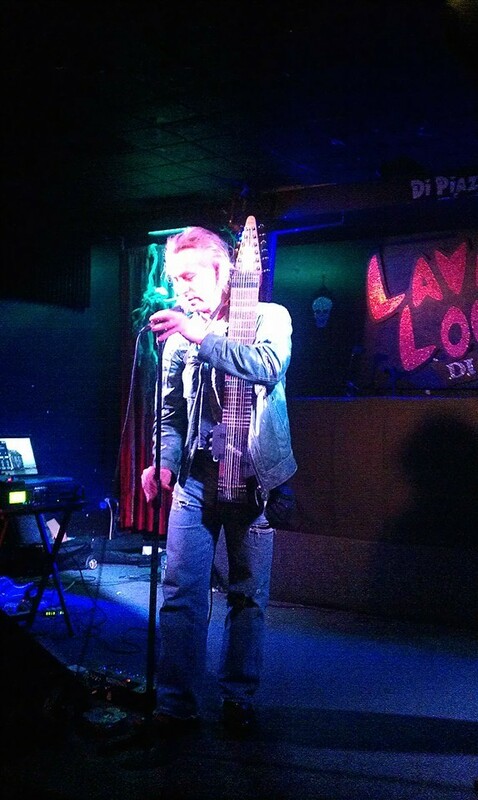 Cut-up techniques, as in “live musique concrète”. 2. Scandinavian folk music, dark and melancholic. 5. Psalms with a northern vibe. But I will also go to Paris already in mid-February for just a few concerts. 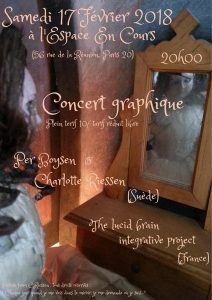 The idea first came up when my beloved Charlotte Riessen was invited to display her visual art at Grand Palais, Salon Dessin. I have loved her art from the first painting I saw, experiencing each piece as a portal offering a look into a parallel world. And of course, the temptation to make myself a transponder for each world’s natural sound environment soon grew massive! 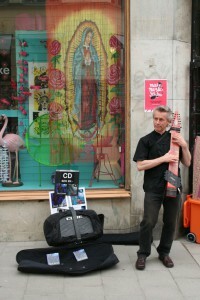 So I suggested coming along to play music around the exhibition. The idea caught on well with the Swedish pavilion admin and I started to book other concerts in Paris for the rest of the week (gotta eat n sleep indoors, you know :-). I will play at the Grand Palais, by the Swedish booth, on Thursday 15th at 15:00. Two other concerts are due on February 17 (Espace en Cours, 56 Rue de la Réunion, 19:00) and on February 18 (Église suédoise de Paris, 9 Rue Médéric, 17:00). At Espace en Cours, on the 17th, experimentation is a keyword for the entire event. Several acts will perform during the night. Formally, it is a teaser for the upcoming Spring Loops #2 Festival, but I will attend as part of a collaborative installation with Charlotte Riessen. Her Dollhouse images and my live noise may breed or clash on stage and, hopefully, the audience will be led through many exciting portals that night. At Église Suédoise, five o’clock on Sunday 18the February, there will be me, and my Chapman Stick, performing the church music program that has grown popular in Swedish summer church music programming. SEK 100:- at the door, Cash or Card. 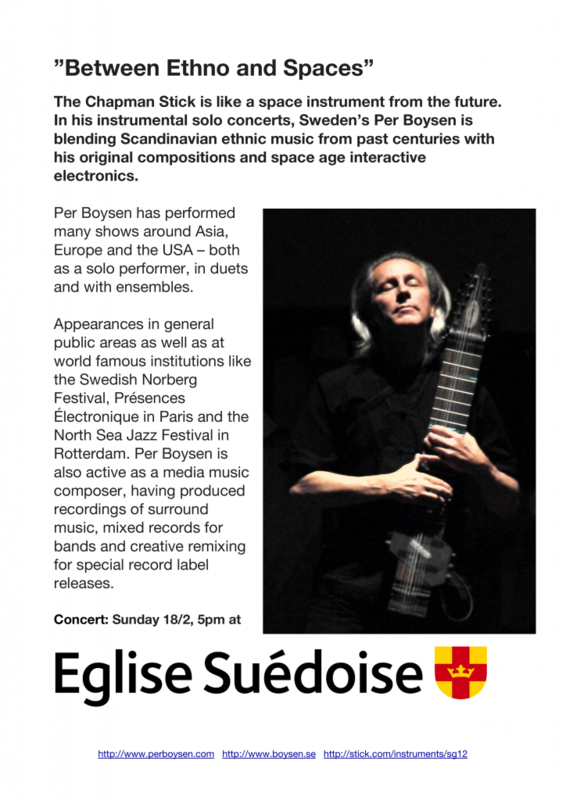 Per Boysen has performed many shows around Asia, Europe and the US – both as a solo performer, in duets and with ensembles. 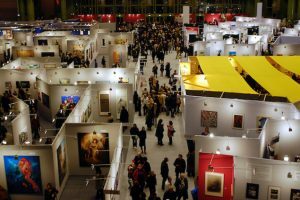 Appearances in general public areas as well as at world famous institutions like the Swedish Norberg Festival, Présences Électronique in Paris and the North Sea Jazz Festival in Rotterdam. 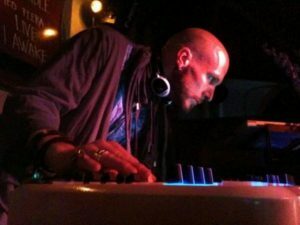 He is also active as a media music composer, having produced recordings in several surround sound formats, mixed records for bands and creative remixing for special record label releases. 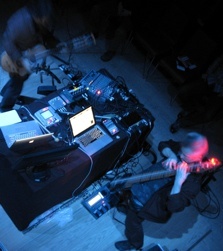 With the Alto Flute and Chapman Stick in focus, Boysen performs simultaneously playing the self-designed electronic meta-instrument that allows instant found-sound cut-up, bringing the classic Musique Concrète methods into the digital era. Built as a journey of audio neural beauty through organic microcosms, electronic vortexes, deep, tribal beats and vast soundscapes, the album takes us on a pilgrimage of sounds, with scents of parallel lives, glimpses of the future and overlapping, coexisting dimensions. A superfine blend of psychedelic spurs, groovy bass lines and catchy melodies composed with the collaboration of Krister Linder, Fredrik Lundberg, Tara Devi and Planet Boelex. As a film soundtrack producer, I AWAKE is one of the key figures of Ghostfriend, a Swedish underground movement of creators with a “peculiar devotion to the present and strong love for the innermost”. For the first time in Ultimae’s history of releases, the artwork was created by famous digital artist and designer David Vineïs aka Sub88. 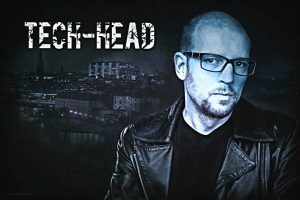 Teach-Head will be wrapping up this triple acts night with aggressive dance music, all performed live on stage. Take music stroll on the south city island, “Söder”, on Saturday! We’re around two hundred music acts that will play all over the SoFo area all day long. 12:00 at Agencies Turquoise, Katarina Bangata 17. 15:15 at Emmaus, Götgatan 14. Read more about this event on Facebook! I was lucky to hook up with Canadian singer-songwriter-stickist Dale Ladouceur for a duo concert happening in Stockholm. Here is the full concert on video, hope you like it! Big thanks to ExitGames Stockholm for working together with us in this exciting project. 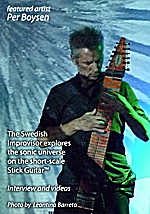 Excerpt from a solo concert at Tynnered Kyrka, Sweden, on June 24 2015. First song “Gammal Fäbodspsalm” is an old traditional folk melody. Second song “Emerald” by Per Boysen is only featured here by the intro part because the camera stopped filming there…. 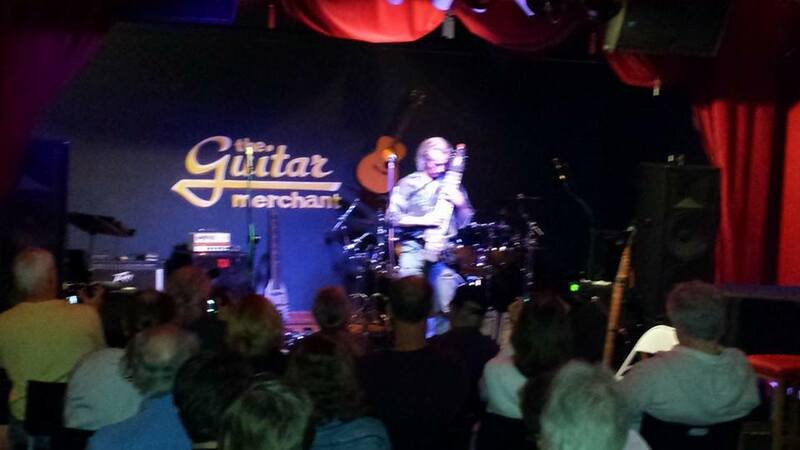 Sorry about that, the full concert was some forty minutes. Below are the dates and venues of my October 2014 US west coast tour. This project would not be possible without the great help from Rick Walker, Gene Perry, the Free Hands Academy, Peterson Entertainment and the Swedish Arts Grants Committee. Thank you! 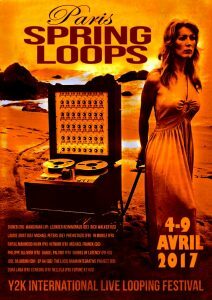 YK2 International Live Looping Festival. For day’s program, several venues in Santa Cruz. 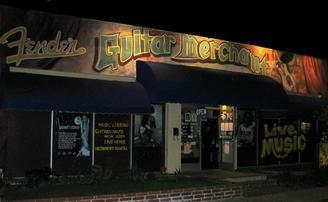 5202 E Pacific Coast Hwy. 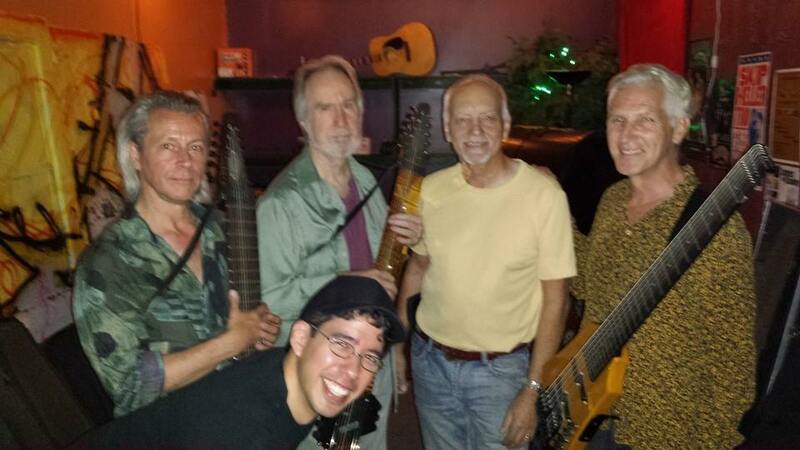 A bunch of Stick players will play solo pieces in a round-robin manner.Do not expect one single dull moment!!! :-) A Stick Night initiated by Gene Perry of the Free Hands Academy. 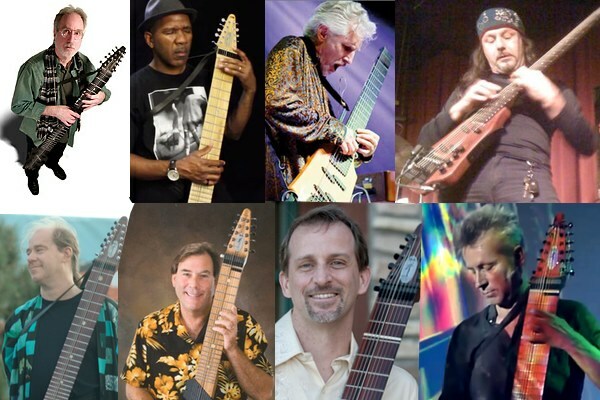 Emmett Chapman, Kevin Keith, Don Schiff, Gary Jiblian, Michael Johnstone, String Planet (featuring Larry Tuttle and Novi Novog), Mike Kollowitz, Gene Perry, Per Boysen.